On Oct. 7, 2013, SpaceX's Grasshopper rocket climbed 2,441 feet (744 meters) into the air before safely landing back on its launch pad in McGregor, Texas. An experimental reusable rocket prototype built by the private spaceflight company SpaceX has made its highest leap yet, soaring more than 2,000 feet above its Texas proving ground as a camera captured the eye-popping test. 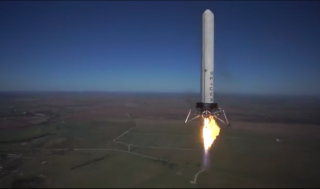 SpaceX's Grasshopper rocket made the giant leap on Oct. 7 and climbed 2,441 feet (744 meters) into the air before safely landing back on its launch pad in McGregor, Texas. SpaceX officials unveiled the amazing video of Grasshopper's highest hop yet on Saturday (Oct. 12). "While most rockets are designed to burn up on atmosphere reentry, SpaceX rockets are being designed not only to withstand reentry, but also to return to the launch pad for a vertical landing," SpaceX officials wrote in a video description. "The Grasshopper VTVL [Vertical Takeoff Vertical Landing] vehicle represents a critical step towards this goal." The most recent test is only the latest in a series of ever-higher flights for Grasshopper. Previous launches took place in September, November and December of 2012. During those flights, Grasshopper reached altitudes of 8.2 feet (2.5 m), 17.7 feet (5.4 m) and 131 feet (40 m) respectively. Its highest hops in March and April of 2013 took the reusable rocket to peak altitudes of 263 feet (80 m) and 820 feet (250 m). In June, Grasshopper climbed to an altitude of 1,066 feet (325 m) before safely maneuvering back to the ground. The Grasshopper rocket, known at SpaceX as the Falcon 9 test rig, is about 10 stories tall. It uses the first-stage tank of the Falcon 9 — the rocket used to launch the company's Dragon capsule to the International Space Station. Grasshopper only uses one Merlin engine unlike the Falcon 9, which sports nine of the privately developed rocket engines as its name suggests. The Hawthorne, Calif.-based private spaceflight company holds a $1.6 billion contract with NASA to make 12 unmanned supply runs to the station. SpaceX has flown two of those cargo missions for NASA already, with the next visit to the station scheduled for early 2014.